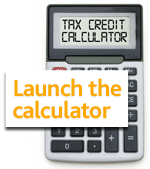 Tax Credit changes calculator: How will cuts affect you? Tax Credit changes are taking effect from today that could leave families thousands of pounds out of pocket. Along with Mumsnet, we’ve put together a quick online Tax Credit changes calculator to help you find out how your household will be affected. It lets you add your details, such as income level and number of children, and it’ll estimate how they will be affected by the tax changes taking place from today and from April next year. 2 Responses to Tax Credit changes calculator: How will cuts affect you? I have just done this calculator and if it is correct do not know how my family are going to cope with the shortfall. The only way I can afford to work is due to having help with child care costs, I have been very unfortunate having been made redundant 3 times since 2006 I have had to take a job that pays much less than before. I did this to keep a roof over our heads, I now have 2 children and did have my mother looking after them but she died and I am know relient on the help I get. What is the government doing to help tax paying people like us!! I know they are doing nothing as I now have a job working with the unemployed and hear everyday how they are cheating the system, many of them are getting benefits equvilant to £25k these changes will only make it more difficult for people like us with no family to help and no way of earning any more money. I know that we have to get out of this mess but it is not the working mans problem it is the greedy bankers make them pay!!!!!!!! I went back to work after 12 weeks of having our little one so that I could earn enough to keep our household going. I appreciate they have to have a threshold but they dont look at people as individuals, we are lumped into one bucket and expected, if you earn above their threshold, you must be able to cope without help form the money you have been paying to the goverment all your working life. I feel cheeted, I’ve worked since I was 16, always paid tax and NI and now i’m told, sorry, we cant help, you’ll just have to cut back. I have nothing to cut back on, I’m down to the bear bones of it all as it is. What more do they expect us to do? Surly as we have paid our tax and NI we are entitled to help when we need it, it’s not like we are asking for it forever! I’d like to know who exactly decides these thresholds and how they come up with the amount… pluck it from thin air I think!